Lewis Gouverneur Morris [1882-1967], New York; by inheritance to his daughter, Frances Elizabeth Morris Smith [1915-1994], Newport and Palm Beach; her estate; bequest 1994 to NGA. Information from telephone conversation with Alletta M. Cooper, daughter of Frances Elizabeth Smith, 5 May 1996 (memorandum, in NGA curatorial files). Paintings by Fitz Hugh Lane, National Gallery of Art, Washington, D.C.; Museum of Fine Arts, Boston, 1988, no. 37, color repro. The Morris Legacy: Profile of a Newport Collection, Newport Art Museum, 2001, not in cat. Perfectly American: The Art-Union and its Artists, Gilcrease Museum, Tulsa, 2011, not in catalogue. The support is a twill fabric with selvages on the left and right edges; it is unlined and is probably on the same four-member mortise-and-tenon stretcher on which it was painted. A thin white ground layer was apparently applied while the fabric was on a different stretcher, because the ground only covers parts of the tacking margins. Underdrawing in a dry medium is visible in normal light in several areas, some of which show changes. 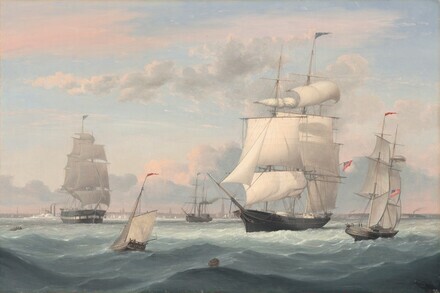 The blue flag flying from the large ship at the center right was originally slightly lower on the mast; several flags were underdrawn on the smaller ship at the right, but not subsequently painted. The riggings of the various vessels have imprecise underdrawing, but the painted lines were possibly executed with the aid of a straight edge. Some of the waves also have underdrawing. The paint layers were applied very thinly, with a low impasto, to create highlights in the waves. The paint surface is in very good condition, with no evidence of significant losses or abrasion. The varnish has not discolored. Wilmerding, John. Fitz Hugh Lane, 1804-1865, American Marine Painter. Salem, Massachusetts, 1964: 59, no. 63. Kelly, Franklin, with Nicolai Cikovsky, Jr., Deborah Chotner, and John Davis. American Paintings of the Nineteenth Century, Part I. The Collections of the National Gallery of Art Systematic Catalogue. Washington, D.C., 1996: 408-410, color repro.